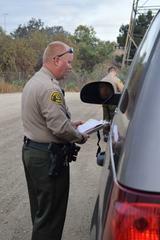 The Los Angeles County Sheriff’s Department Metrolink Bureau partnered with several law enforcement agencies to enforce traffic laws at railroad grade crossings in several Southern California Counties used by commuter rail. The goal of these grade crossing enforcement operations was to bring awareness through education and enforcement. Each of the participating departments fanned out to monitor rail crossings during the enforcement periods. Although LA Sheriff’s Metrolink Bureau units routinely patrol rail grade crossings, when not answering calls for service, the deputies have partnered with police departments in the cities of Los Angeles, Fontana, San Fernando, Simi Valley, and the Union Pacific Police, B.N.S.F. 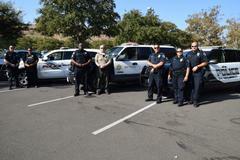 Police, and the Riverside County Sheriff’s Department. These law enforcement agencies have targeted certain railroad crossings during the month of September, which is National Rail Safety Month. The operations were conducted on September 7th, 14th, 21st, and the 28th, 2016, during the hours of 6:30 AM to 10:00 AM. The enforcement operation that took place on September 14th coincided with a press conference hosted by the Southern California Regional Rail Authority or Metrolink. The press event took place at the Cesar Chavez Memorial near the intersection of Truman Street and Wolfskill Street, in San Fernando, California. This intersection was the scene of a horrific accident in February of 2015. Luckily the occupants of the vehicle made it out before the vehicle was struck by a Metrolink train. However, this was another example of when a motorist did not leave enough room to clear the railroad crossing and was stuck on the tracks behind traffic when the train was approaching. Metrolink Chief Executive Officer Art Leahy spoke at the press event about the need for enhanced public awareness when pedestrians and motorist are in and around railroad crossings. Mr. Leahy also introduced Sheriff’s Metrolink Bureau Captain Andrew Rosso. The Metrolink Bureau of the LA County Sheriff’s Department provides contract police services to the 7 different commuter train lines that Metrolink runs through 6 different counties. 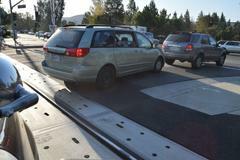 Approximately 8000 vehicles and pedestrians were monitored crossing the railroad tracks at various crossings. And 4 vehicles were towed. There were several Misdemeanor arrests also made during the enforcement operations. Most were cited back to court for adjudication of the cases. The National Transportation Safety Board (NTSB) has shown that railroad deaths have increased year over year, and the vast majority of fatalities are trespassers, including those struck by trains at rail grade crossings. Rail grade crossing accidents involving Metrolink trains, like those in Burbank, Oxnard, and just recently in Sun Valley, remind us of how just one vehicle making contact with a train travelling at an average speed of over 60 miles per hour, can cost the lives of motorists and train passengers alike. Enforcement operations like these have been shown by the NTSB to reduce the number of safety incidents involving vehicles and pedestrians. 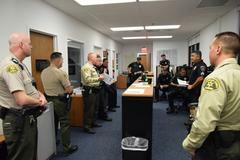 To receive detailed, up-to-date information directly from the LASD via e-mail, register for "Nixle" alerts at www.Nixle.com and register for "LASD-Transit Policing Division HQ, Los Angeles County Sheriff" and also register for your local LASD station area. Or, text “LASD Transit HQ” to 888777 to receive text alerts only. Standard text messaging rates may apply, depending on your calling plan.